It's amazing what movies slip through the cracks. Citizen Kane took years to be recognized for its achievements, Office Space was widely ignored until it was released on home video, and Antonia Byrd's Ravenous continues to be a dark comic gem seen and beloved by far fewer than it rightly deserves. While hardly as important to film history as Citizen Kane, this part Western, part horror film deftly weaves varying genres with a thread of black humor, tying together a package that is delicious to sink your teeth into. Ravenous is set in 1847, with Captain John Boyd (Guy Pearce) being banished to a remote outpost due an act of extreme cowardice in battle. Soon after Boyd's arrival at the base, a mysterious stranger, Colqhoun (Robert Carlyle), appears in dire medical need. This Colqhuon is not all he seems; he is actually a Wendigo, a man of evil corrupted due to having eaten the flesh of another human being. What follows are daring chases, gruesome murders, suspense and intense character drama. While the movie grounds itself in a historical context (and as a period piece, the world is well constructed without any glaring anachronisms), the key to a movie with a supernatural horror is making that horror believable. In the case of Ravenous, we don't have any latex monsters to deal with, so it falls down to the actors to make this experience something that strikes a chord with viewers. Robert Carlyle takes up this burden and carries it spectacularly. He breathes such intensity into Calqhoun that he is absolutely captivating. When he stands there taunting one of the poor outpost men with a strange and disturbing chant before beginning to dig like a madman at a spot in the ground, you just watch with rapt attention. Instead of going over-the-top with his character's mania, Carlyle just tips the scales into the realm of sheer uneasy insanity. He plays Calqhoun as a devastating predator, one that can act the animal for when fear is needed, and the sophisticated man when needing to lay a trap. Each of this modes seem like opposite sides of the same coin, not disparate character traits; when Calqhoun acts more refined and sophisticated about his cannibalistic nature later in the movie, it feels like a natural progression for the character rather than a reversal. Guy Pearce as Captain Boyd complements Robert's performance amiably. With a subtle and muted portrayal, his character comes across as a man of quiet desperation and fear. With heaving breathing and wide eyes, Pearce gives more depth to the character than any amount of broader strokes could demonstrate believably. When we see Boyd in the flashbacks to when he was behind enemy lines in the war, we see that sheer fear in his eyes and we instantly feel compelled by the character's plight. When Boyd faces off with Calqhuon in the course of the film, Pearce and Carlyle play off each other's performances with explosive chemistry. Pearce's performance compels, it grips the viewer, and above all it entertains. Though even beyond the acting, one of the joys of Ravenous is the delicate balance that screenwriter Ted Griffin maintains between serious drama and the black humor. 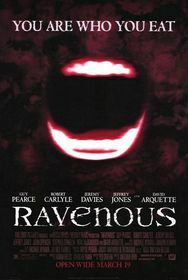 Ravenous is above all a horror film, and so most of it is given over to frights and the trauma. Still, Calqhoun cracks little jokes about cannibalism at many a turn, and even the end of the film has a kicker that makes you laugh rather than reel back in horror. One of the more subtle threads of humor is the film's ironic juxtaposition of Calqhuon as a Christ figure. When the camp attempts to revive the frozen Calqhuon at the beginning of the film, his pose is like that of the crucified, his arms outstretched; he even has one hand clenched around a rosary. Later, he compares the eating of flesh to the practice of Holy Communion, the ritual eating of the body of Christ. At the end, Calqhuon wears a little blood smear of a cross on his forehead. The best part is that these references don't take you out of the film. This humor does not make you bust a gut, but instead makes you chortle, just to break the mood a little, making the horror that much more effective. The most striking thing that really works in this movie is Damon Albarn and Michael Nyman's soundtrack. The haunting theme of 'Boyd's Journey' will stick in your head for days after seeing the movie. Just as the film blends humor and horror, the soundtrack blends modern drum loops and harmonic dissonance with traditional instruments of the mid-19th Century. 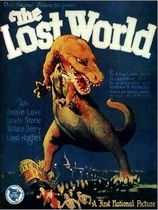 The result is part John Carpenter synth and part old-fashioned bluegrass band, a unique sound that blends well with the genre-bending nature of the film. This music enhances the mood of every scene, from when Calqhuon spurs a chase with the taunting cry of "Run!" to the ending credits. 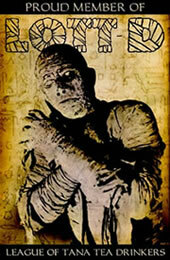 When Calqhuon launches into a monologue about how he came to eat human flesh, it is a moment of little visual note. However, playing behind this amazing bit of acting is a tension building bit of music, heightening the intensity of the drama. Ravenous really is a full package deal. A simple but compelling story, emotionally evocative performances, and a strong score all combine to something that was sadly neglected at its time of release. You owe it to yourself, however, to take the time to discover it now. It may not be Citizen Kane, but it's still damn entertaining.